"She is the one constant in Hawaiian music," says radio personality Aloha Joe. It's a statement few would contest, as it applies to one of the venerable voices in Hawaiian music, Genoa Keawe. "Aunty" Genoa turns 89 in two days, on Halloween. But even as the accolades pour in, acknowledging her longevity and the mark she's made across generations, she insists, "I'm young!" Certainly, her continuing influence and the youthful strength of her unmistakable falsetto attest to that. An 89th birthday is a long time coming. So many people want to help Genoa Keawe celebrate hers this week that one night isn't nearly enough. » Wednesday: 6 to 8 p.m., Ala Moana Hotel; free. Call 955-4811. » Thursday: 6 to 8:30 p.m. Waikiki Beach Marriott Resort and Spa; free. Call 922-6611. And so, Genoa's birthday -- which falls on Halloween -- will be marked with two public celebrations. On Wednesday she'll appear at the Ala Moana Hotel for its weekly online video show, and on Thursday she'll host her weekly engagement at the Waikiki Beach Marriott Resort and Spa. Both venues present free Hawaiian music week in and week out, and both are certain to be filled to capacity when "Aunty" Genoa and her musicians take the stage. The family -- complete with great- and great-great-grandchildren -- will celebrate privately on Friday. Genoa will also headline a benefit concert for the Hawaiian Music Hall of Fame and Museum next month. She became the second living inductee into the Hall in 2001 -- more than 50 years after making her first recording, "Maile Swing," for 49th State Hawaii Records in 1946, and almost 60 years after her debut as a professional entertainer. "Genoa is the pillar of the house for Hawaiian music," says Puakea Nogelmeier, a Hawaiian language teacher and songwriter. "She has for scores of years been the reference point for Hawaiian musicians and has bridged tradition, to territory, to 21st century." But although she's been on stage since long before most of today's chart-topping local artists were born, don't call Genoa "old." "I'm young," she says, laughing, as she describes a lifetime of devotion to music. "I always did love Hawaiian music. I'd hear everybody singing those tunes," she says, recalling her years growing up in Kakaako, then a vibrant Hawaiian neighborhood. Her neighbors included slack-key guitarist Herman Kane and his son, Raymond, and another aspiring musician, Charles Philip Pahinui. Even then, growing up on Magoon Block, she loved to perform. Left unsupervised, she'd spend the day playing music instead of doing chores. "(My mother) would come home thinking that the house would be all clean already, but I'd just sit down and strum the ukulele. You know that song, 'five feet two, eyes of blue'? It used to be our favorite song." Not only that: "There was a Japanese boy that used to dance the Charleston, and me, I'd join in with him. I used to be good at (the) Charleston." 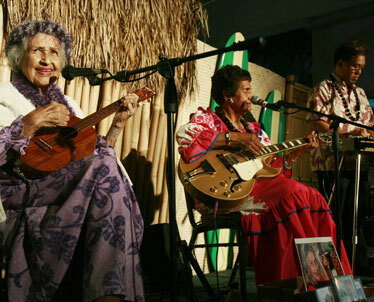 Genoa Keawe, left, performs with Momi Kahawaiola'a and Alan Akaka at the Waikiki Beach Marriott Resort. "Aunty" Genoa, who turns 89 this week, continues to make weekly appearances at the Marriott and remains in full voice. "Aunty Genoa is one of the most influential figures in Hawaiian music and, as a result, in Hawaiian history." "Genoa Keawe stands alone as the only Hawaiian entertainer who has had her recordings released commercially on every recorded medium available over seven decades (and) two centuries." -- Harry B. Soria Jr., "Territorial Airwaves"
"Every day someone will ask me to play 'Green Rose Hula' or ''Alika' or another of her classic recordings. She is the one constant in Hawaiian music, and her Thursday shows are on everyone's 'must do' list!" Genoa Leilani Adolpho met Edward Keawe-Aiko while visiting a cousin in Kahana, and married him after she graduated from the eighth grade. She raised 12 children while going from one success to another as a singer and recording artist -- even though her husband at first didn't think it was appropriate for his wife to be singing in nightclubs and bars. Although some people talk these days about a revival of traditional female Hawaiian falsetto singing, Genoa has always sung the falsetto classics, most notably her signature, "'Alika." Some of the great falsetto vocalists are gone -- Lena Machado, Leinaala Haile and Linda Dela Cruz, to name three -- but others are expected to join Keawe at one or both of her parties. Among the guests, certainly, will be her granddaughter Amanda Pomaika'i Keawe, already recognized as an accomplished falsetto vocalist. 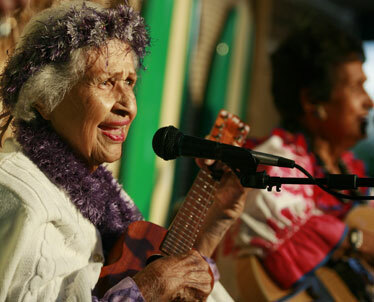 Genoa is grateful to her mother-in-law for teaching her Hawaiian, which has allowed her to sing in a manner appropriate to the meanings of the songs. It also helped her understand what was going on at the breakfast table between her mother-in-law and her husband. "Every time I would be sitting down at the table in the morning, the two of them would be talking in Hawaiian, you know, and I would look at him and look at her and look at him -- I said, 'I know you folks talking about me,' because they're looking at me and talking." Her opinion, then, holds credence on such matters as the meaning of the Hawaiian word ha'i, which some people use only in reference to falsetto singing by women. Genoa says it applies to a vocal technique used by both genders. "Ha'i is 'to break,' but (when) you (use it, you) still got the tune," she says, giving a brief but exquisite a cappella demonstration. Hawaiian singers will often emphasize the break (ha'i) when shifting in and out of falsetto; European-American falsetto singers do not. Ironically, perhaps, Hawaii's grand dame of Hawaiian female falsetto grew up with a love of American pop music as well. "Embraceable You" is one of her all-time favorites, although it doesn't fit the playlist of her weekly show at the Marriott. And does she have a favorite Hawaiian song? She laughs. A bright, light, musical laugh. "They're all favorites of mine."